ANCHORAGE, Alaska, September 1, 2015 (ENS) – In his first visit to the Arctic as President, Obama saw evidence of global warming firsthand and made an urgent plea for world leaders to waste no time in joining forces to combat climate change. Speaking at the the GLACIER conference in Anchorage, convened by the U.S. State Department, Obama took the stage at the Dena’ina Civic and Convention Center. In a Monday evening speech streamed live on the White House website he said repeatedly, “We’re not moving fast enough” to stop the advancing impact of climate change. Climate change is one of the biggest threats we face, it is being driven by human activity, and it is disrupting Americans’ lives right now, Obama said. In the audience were foreign ministers and officials from 19 countries and the European Union who took part in the conference. The world’s top six greenhouse gas emitters were all there: China, the USA, Russia, India, Japan and Germany. Arctic nations were there: Canada, Denmark, Finland, Iceland, Norway and Sweden – and so were other key states: Italy, Netherlands, Poland, Singapore, South Korea, Spain, and the United Kingdom. U.S. Secretary of State John Kerry led the conference. “In fact, the Arctic is the leading edge of climate change – our leading indicator of what the entire planet faces,” he said. Obama took aim at climate deniers who oppose taking action to limit the greenhouse gas emissions responsible for the rising planetary temperature. “And we’re starting to see that enough consensus is being built internationally and within each of our own body politics that we may have the political will – finally – to get moving,” he said. “So the time to heed the critics and the cynics and the deniers is past. The time to plead ignorance is surely past. Those who want to ignore the science, they are increasingly alone. 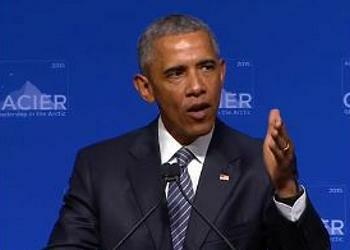 They’re on their own shrinking island,” Obama said to applause. The salmon populations that native Alaskans have relied on for generations are already being hurt by the warming climate, and the President said he is acting to give Alaskan tribes more control over salmon management. “My administration is taking new action to make sure that Alaska Natives have direct input into the management of Chinook salmon stocks, something that has been of great concern here,” the President said after a long, private roundtable discussion with native Alaskan leaders. Obama made it clear that he is listening and will take action to help native Alaskans, who belong to 11 distinct cultures, each with its own language. “One of the biggest things I heard during this discussion was the need for us to work more intensively and more collaboratively with communities, particularly in rural areas, that are burdened by crippling energy costs, that are obviously continually concerned about hunting and fishing rights and their ability to sustain their way of life in the face of profound climate change that’s taking place – taking place, in fact, faster – twice as fast here in Alaska as it is in the Lower 48,” he said. 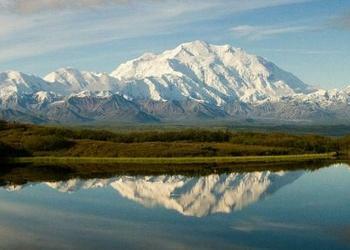 In another gesture of respect for native Alaskans, U.S. Secretary of the Interior Sally Jewell Monday announced that the highest mountain in the United States and North America, formerly known as Mount McKinley, will be officially given the traditional Koyukon Athabascan name of Denali, or The Great One. The 20,237-foot mountain was named Mount McKinley in 1917 after U.S. President William McKinley, the 25th President of the United States. He served from March 4, 1897, until his assassination in September 1901, six months into his second term. Recognizing the long history of strong support from Alaska state, tribal and congressional leaders, and in resolution of an official request for a name change pending for 40 years, President Obama endorsed Jewell’s decision to issue a Secretarial Order that officially changes the mountain’s name. 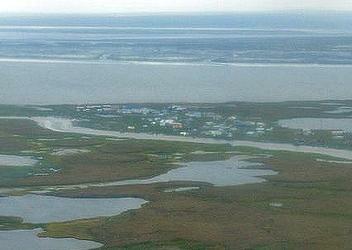 Alaska Governor Bill Walker, an Independent, applauded the name change. The six million acre Denali National Park and Preserve, where the mountain is located, was established in 1917 and annually hosts more than 500,000 visitors. The President will be in Alaska through Wednesday. “I’m looking forward to talking to Alaskans about how we can work together to make America the global leader on climate change around the globe,” he said. Environmentalists support the President’s position on climate change.